The Homelite String Trimmer is part of the Homelite family - a company with a well known name for manufacturing a large variety of power equipment for the home, the professional, and for industry. Both of the Homelite trimmers offered feature the same 2 cycle engine, which has been modified to produce cleaner exhaust. A 4 cycle engine is more efficient than the 2 cycle engine, and produces a much cleaner exhaust. California has higher standards for engine exhaust, and these requirements are going to become more strict over time. The Homelite trimmer model UT32600 is a typical curved flexible shaft trimmer designed for the homeowner. Homelite has the ‘Quick-Fire’ carburetor for faster starting. The cutting head is a ‘Reel-easy’ bump head, which advances the twin cutting lines when bumped firmly against a hard surface at high engine speeds. The handle is the typical loop style - adjustable to the position on the shaft that is preferred for optimum balance. 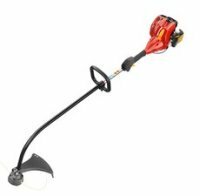 The weight of this economically priced trimmer is 10 lbs, which is about average for a flex shaft 2 cycle trimmer. The price for this work saver is a reasonable $100.00. The Homelite trimmer model UT32650 takes the same engine as it’s curved shaft brother,and adds a straight shaft instead. Everything else remains the same, from the ‘Quick-Fire’ carburetor for faster starting, to the ‘Reel-easy’ bump head, which advances the twin cutting lines when bumped firmly against a hard surface at high engine speeds. The handle is the typical loop style - adjustable to the position on the shaft that is preferred for optimum balance. The weight of this entry-level straight shaft machine is 10 lbs. The price for this baby is a reasonable $100.00.